Why don’t more people take an interest in audio gear? 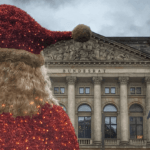 It’s an industry lament as old as Christmas. The answer might lie in a simpler question: what precisely is being sold? For the home theatre crowd, the message is contained in the language itself. At our local electronics store, we see the screen and a multitude of loudspeakers, all set up for a home theatre demo. There’s even a couch to sit on. But it’s not really about the gear per se. We’re being invited to take the movie theatre experience home with us. A scaled down version of the one we regularly visit downtown or at our local mall. Being sold is an experience. What experience are hifi stores selling? “High fidelity” isn’t as inviting as “home theatre”. Ask a summit-fi fan for clarification and he’ll likely point to the accurate/believable reproduction of a live concert in a home listening space. However, our die-hard audiophile probably isn’t talking about Kiss or Deadmau5; he’s talking about an (un-amplified) orchestra or small jazz ensemble. Little wonder the broader market fails to relate to “hifi”. What experience might more effectively build a bridge to the mainstream. It isn’t in the gear per se. To the curious entry-leveller, it isn’t in the tens of anonymous black boxes piled high on three walls of a listening room. “What are these things?” he might nervously ask of himself. The store owner punching in this loudspeaker and then that loudspeaker from a switch box isn’t necessarily helping any. Why? Because this experience is like nothing we’d ever see or do at home. How about another way? A listening room built to look and feel like an average lounge room. A pair of loudspeakers, an amplifier, perhaps a turntable, a streamer and an iPad would be present but they wouldn’t necessarily be the focus of the room. Instead, it’s the experience of the room as whole – and how it mirrors our home life – that matters more. Here our focus turns to interior design: a nice carpet, a rug, a sideboard or TV bench with small TV, a couch with cushions, a lamp with an attractive lampshade, a coffee table, some magazines, a bookcase with books, another set of shelves that house a real vinyl collection with records familiar to your average mainstreamer, framed posters on the wall, a drinks cabinet (perhaps) – the aim is to make it feel less like a store and more like home. Think of the average IKEA catalogue: it isn’t page after page of product shots, descriptions and prices? A good portion of the visual branding is given over to complete rooms. Ditto in-store where prefab rooms are presented as fully furnished. Sounds like a lot of work for the average hifi high street retailer, doesn’t it? And it is. Keeping things tidy and rotating the audio hardware on a daily basis and/or according to customer demo needs takes serious man hours. Perhaps too much work for the average hifi store in possession of only a single listening room (? )…but less so for those with numerous spaces. One German store that might have the chops to pull this off are Saturn; not a hifi shop but a big box retailer of household electronics. Think of them as the Best Buy of Germany. 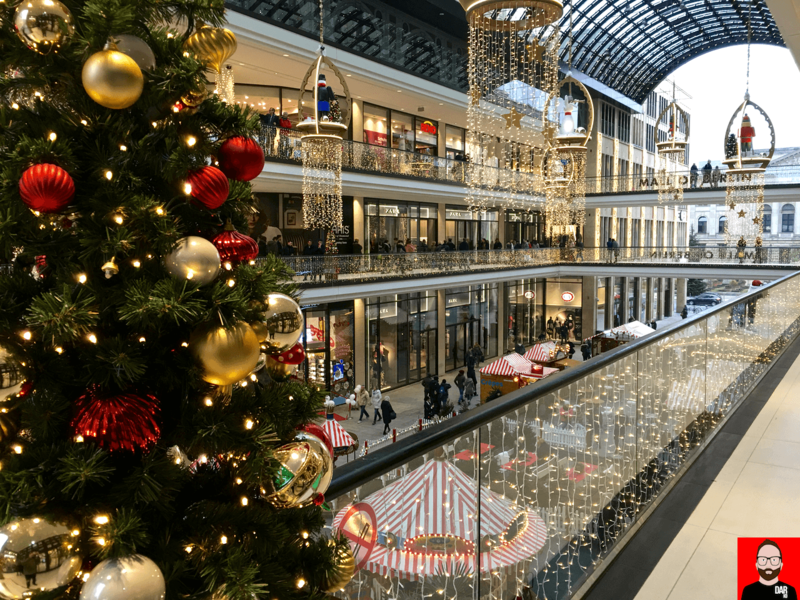 There are three Saturn outlets in Berlin, the largest of which sits a stone’s throw from Potsdamer Platz in the gargantuan LP12 Mall of Berlin. 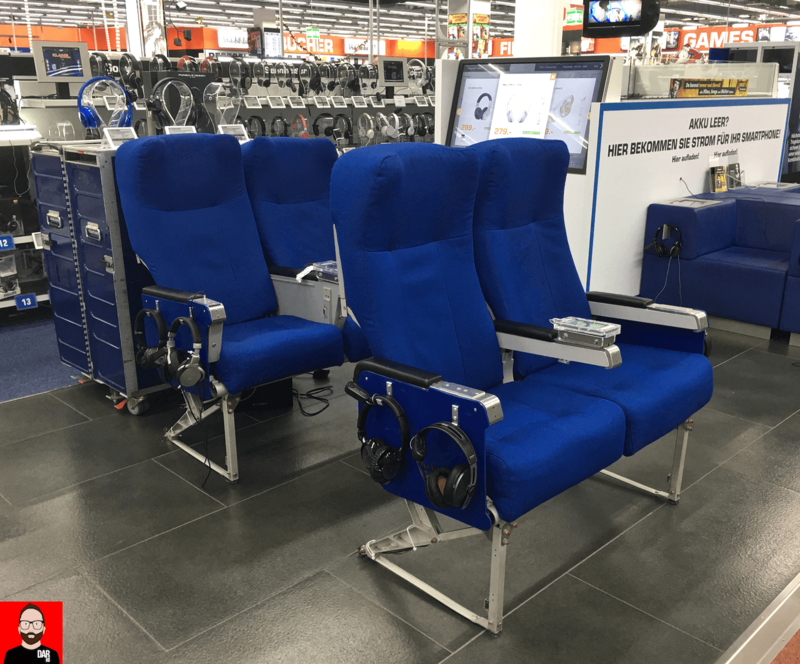 In the middle of Saturn’s shop floor sits a headphone listening station like no other: two pairs of airline seats connote the listening experience of in-flight audio and the need for noise cancellation. You sit, you listen. Forget that it’s a Samsung phone strapped to the armrest – the experience matters more than the South Korean company’s inferior sounding smartphone. 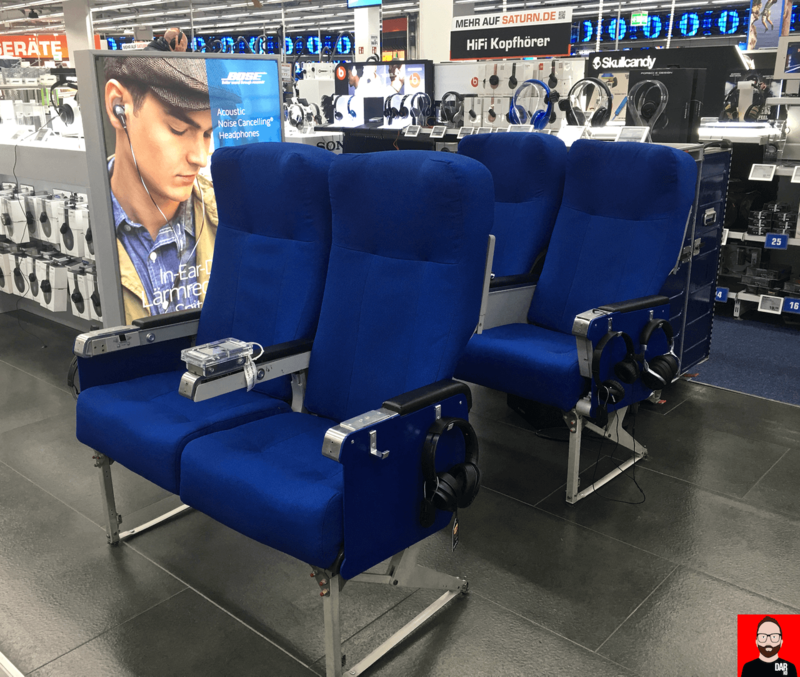 The store’s background buzz isn’t as loud as that of an aeroplane but it’s sufficient to get a handle on the effectiveness of the noise cancellation circuitry housed within headphones offered by Sennheiser, Bose and Sony. 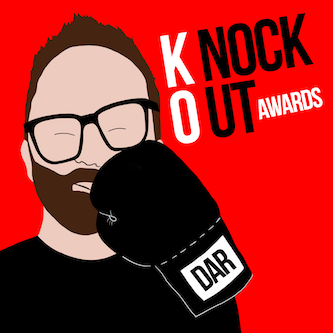 To this commentator, the world of audio retail benefits hugely, especially in connecting with mass market buyers, from a little effort and/or out-of-box thinking spent on emulating the numerous contexts and environments in which we listen to music. The nature of our surroundings speak our emotions, just as music does. Creating a demo environment that speaks to our daily lives and routines makes us more likely to spend cash on audio gear. How about using a kitchen to sell Bluetooth speakers or parking a bus in the middle of town as headphone pop-up store? How about a little cross-pollination between high-end furniture stores and hifi retailers? If Saturn is still along the same scale as it was 20 years ago, then Best Buy would be a hot dog cart to Saturn’s whole restaurant district! 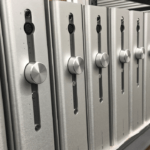 The speakers were hooked up to an AV receiver, in a room full of speakers backed up against a wall, placed on a shelf with dozens of other speakers. And some people wonder why 2 channel audio isn’t doing well in a Big Box electronics store. I’ve demoed speakers at Best Buy and the arrangement of the speakers was the same. Even many specialty audio dealers I’ve been to use similar arrangements. When you carry so many products it is difficult for a dealer to demo them properly. Fact is I’ve never purchased anything from a brick and mortar dealer because they usually have a restrictive return policy. @Angelo – right. But perhaps you should not waste their time if you are not planning to purchase through them. This is precisely why most dealers are out of business and or had to ramp up their return policy. Cross-pollination would be nice. Unfortunately it rarely works. It only works if the store owner is into both. In my 30 years of high end retail experience – both furniture and electronics the cross-pollination almost never worked – and we tried at least dozen times with different scenarios. Furniture sales folks are simply not interested nor educated to sell electronics and vice versa. It takes a fan to do both at the same time – a rare breed indeed. + The customers visiting either store rarely pay any attention to the counterpoint on the display. Yes there is few electronics stores that feature nice interior design touch, have sensible salespeople and demo shiit correctly. In Manhattan that would be Innovative Audio. 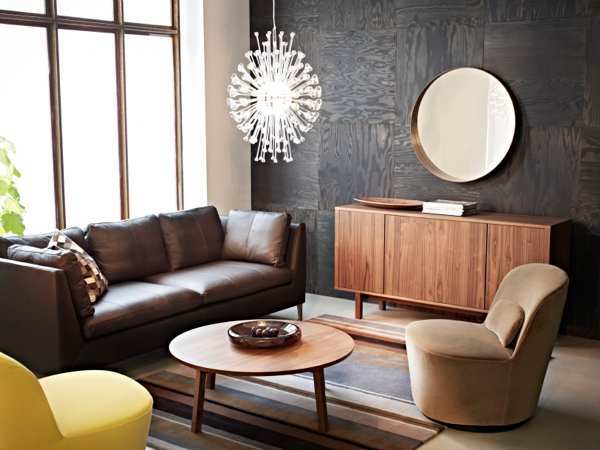 On the furniture side there is an absolutely phenomenal furniture store BDDW – downtown Manhattan, that has impeccable furniture and some groovy one of a kind electronic pieces of a similar pedigree as Fern and Roby. For those visiting Best Buy anticipating a quality service, quality demo and a proper decor – common, get a grip!!! It’s a “Best Buy”!!! Are you going to McDonald to get a New York strip and a glass of Barolo? I kept my expectations low with Best Buy, but apparently not low enough. I had time to kill, and I had a fallout with my local Rogue\Auralic\Magnepan dealer who tried to sell me a store demo Rogue Sphinx v2 for an amount more than MSRP (tubes need break-in, was his excuse). I wanted to head out, and thought I’d give B&W a chance. Guess what – they sound crappy hooked up to a Denon receiver. Typically a home theater receiver is geared towards consumer speakers and they tend to sound splashy, closed in and generally not Hifi nor High End. Good luck with finding the right fit…Cheers!